Your calendars are disorganized. The filing cabinets are disheveled. That memo from last week that you’ve been meaning to send to your colleagues still hasn’t been sent out yet. You need help, and help is finally on the way because your company has made the decision to hire administrative professionals for your department. Hiring that professional is sometimes easier said than done. Though there are plenty of candidates currently searching for new opportunities, finding the perfect candidate can be tricky. Education level, experience, and salary requirements are all factors that should be considered when looking at your candidates; however, don’t forget to pin-point soft skills, as they are just as important as the experience and hard skills on a person’s resume. Are Soft Skills Really Important? All three of the above factors are soft skills, and though many organizations cited that they prefer to have college-educated folks, 64% said they would still consider a candidate with the right soft skill match regardless of education level. What Soft Skills Should I Look for in Administrative Professionals? Now that your company has agreed to hire an administrative assistant, it’s important to establish things like job description, salary range and skill requirements – for both hard and soft skills. For administrative assistants, soft skills like friendliness, active listening, organization, and team spirit are all great qualities and skills to look for in your candidates. Don’t forget to include soft skills and qualities that would tie into your company’s culture and personality. If your team enjoys working in a more collaborative, open office space as opposed to walls and cubicles, it may be wise to look for someone who is comfortable out in the open, enjoys large groups of people and is less concerned about a lack of privacy. This is Jessica. Jessica is one of the many administrative professionals out there looking for the next opportunity in her field. Like many admin candidates out there, she’s college-educated, agile and friendly. Jessica has done her research on things like salary requirements and job duties and is ready to make her way into the workforce. Here at Ajilon, we pride ourselves on helping great companies come together with great candidates everyday. 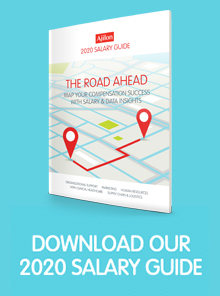 One way we do that is by equipping companies with the knowledge in our Salary Guide. With our 2015 Salary Guide, companies across the United States can match up correct, competitive salaries for the positions they’re trying to fill with top candidates in the industry. Don’t miss out on this opportunity to sang your free copy.